Shields on Full – Love. Life. Practice. 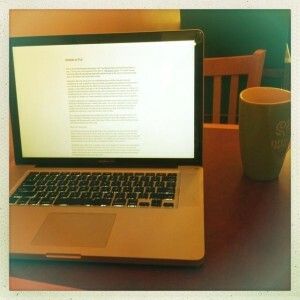 This is yet another blog post that begins with “Leo Babauta had some interesting things to say…” In this case, I am enamored of his post on “Full-Screen Living.” It’s a great concept, and had some pretty immediately applicable elements (such as the way I’m writing this blog post, in WordPress’ full-screen editor mode). Basically it falls into that whole anti-multitasking focus and flow mindset: that real satisfaction (as well as effective work) can be best accomplished by getting rid of distractions. On a screen that’s things like the GMail tab that you keep watching for incrementing numbers, or the twitter notification or the facebook chime or the ping of someone texting you. I myself am almost certainly addicted to the need to check email, and it takes a real effort to do something like this with focus and not check to see if my client has made a decision on the next phase of a project or if a recent potentially emotional email has been read and replied to. It could be argued that the headphones playing Glee tunes and the cup of coffee next to me are distractions that keep me from working “full-screen” the way Leo described it, but hey, small steps, ok? Coffee is the dilithium crystal that fuels my warp core, dammit, and the music is actually a part of the focus, by eliminating the distracting noises of the coffee shop with familiar and well-known tunes that (mostly) make me relax. I’m not going to spend much time talking about Full-Screen Living. Leo does a great job of that, and there’s something disingenuous about just parroting other bloggers. However, in keeping with the pragmatic nature of this blog, I’d like to point out another benefit of turning your current life-state into full-screen. One of the most annoying things about life is that it happens at the most inconvenient time. That is, when you may want to call a time-out, whether it’s due to pleasure or pain, life just keeps going on. Your lover just broke up with you? The quarterly report is still due, the dog still needs his teeth cleaned, the car still needs a new muffler and your daughter is looking at you and wondering why you don’t seem as enraptured by Blue’s Clues as she is. Life doesn’t give a damn how wounded we are, or how happy. The universe was not designed for our convenience, and that means that even when we are in the throes of that delicious white-chocolate-chip macadamia-nut cookie it will ruthlessly point out that cavity in the back molar, or let you trip over a vicious misaligned sidewalk paving, or have that be the moment you drop your phone and shatter the screen. Moments like that can make you feel like the whole world is out to get you. Either it’s Can’t I get a frakkin’ break? or it’s Can’t I just get to enjoy this without life having to ruin it? The answer to both, of course, is No. The universe will not stop for your convenience. Of course, you don’t need the universe to stop. You have the power to take care of it yourself: shields on full. Sure, “full-screen living” can increase productivity. Oh, yes, it’s marvelous for slipping into that “flow-state” and feeling a sense of peace and accomplishment. But Leo doesn’t mention another reason to try to turn your actions into a slo-mo closeup: self-care. It’s a marvelous tool for escaping a bad event to a better one or defending your happy place from the misfortunes that are trying to yuck your yum. Blue’s Clues can be an immersive experience, especially when shared with the wide-open brain of a child. Bills, emotional drama, etc don’t stand a chance. And if you close your eyes and stand still and savor every flavor wave of the cookie, you won’t trip, you won’t be touching your phone, you won’t see anyone. In fact, if you close your eyes first, it’s safe to stick your fingers in your ears, too, further focusing your senses and keeping you oblivious to the funny looks people are directing at you. Turning your life on “Full-Screen” (the latter, by the way, is a synonym for “shield”) means that the other things can’t get in. It gives you a breather, in other words, and lets life go on outside of the shield while you’re safe inside. Some of you might be saying “oh, you’re talking about compartmentalizing.” I don’t necessarily agree – I think that it doesn’t “shut away” or box up anything, it is simply an active choice about how and what to focus on at a given time. The “how” is fully and the “what” is Life. If it’s going to keep on happening regardless, why not use that to your advantage? It’s really just another incarnation of the Delicious Strawberry. If you use this method, though, there are two things you need to be aware of. First, people may mistake “choosing what to care about now” with “not caring”. Some people process life as it comes, and choose to deal with things as they happen and stay with them. That’s fine if it works for you, and you have the ability to spend the time on the problems that come up. If you choose to focus on something other than the problem at hand, though, it may seem dismissive or callous to others. Not much you can do about it, but be aware that may be the impression you’re giving. The second important thing is that shields are defensive, not offensive. As I said, life does continue to go on outside, and it’s important to realize that putting up shields doesn’t solve anything except your current stress level. 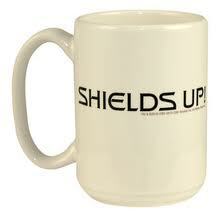 Just like in the scifi movies, shields have a finite energy source, they weaken under constant barrage, and when they come down the Klingons, Romulans, Cardassians, Borg, ROUS’, zombies, Umbrella Corporations and conservative evangelist gun-toting Amway salesmen are still waiting outside. But having your shields on full gives your subconscious time to deal with things like fears and preconceptions. It gives your body a chance to normalize fight-or-flight hormones and let you approach life with a more even keel. And best of all, you won’t miss out on that smile of glee on your daughter’s face as she lives full-screen with you.